I was lucky. When I arrived in Ko (Ko is Thai for island) Samui it was already October, and while it was far warmer than I prefer my autumnal temperatures to be, the cool breezes wafting off the Gulf of Thailand, the autumn rains blowing in from higher ground kept things downright comfortable throughout my sojourn there. I had been told I was headed to Heaven, and nothing about my 8-day stay disabused me of that notion. 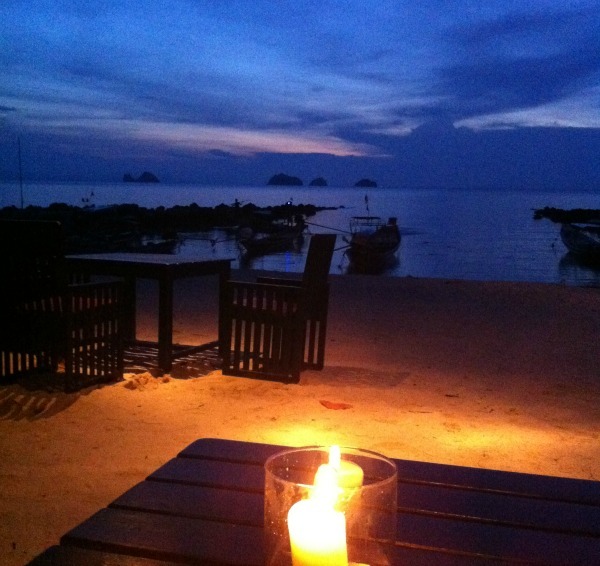 Thais are proud of this island with its langorous beaches and island calm. The concierge in my Bangkok hotel told me it was his dream to go to Ko Samui. He said he has to work too much and can’t get away, but if he could ever get a vacation, he would head straight for Samui. Who wouldn’t! In October, Samui is a veritable perfection. When the rains come, they cool the jungle, refresh the air, descend deliciously. After they leave, the air is clear, crisp, clean. Everywhere you go are sandy beaches, and when the fishermen are not dumping their garbage, the beaches are downright pristine. The water remains warm enough that you never need to acclimate; just jump right in! And yet they have just enough chill to envigorate. Lots of expats live on the island, and that makes it very comfortable to be a “foreigner” in Samui, but it also poses a challenge. If the quiet, serenity of Lamai or Netong, for example, or the solitude of Boku seem commonplace, then the crowding and the noise of Chaweng can be jolting. Night life in Chaweng — especially along the routes of the Sexpats, foreigners here for a deeper plunge into Thai hospitality. Dance club owners, fight promoters, even bar girls’ agents roam the streets in vans equipped with loudspeakers and recorded music to accompany a speaker extolling the virtues of the establishments, inviting all who are hungry to come imbibe. 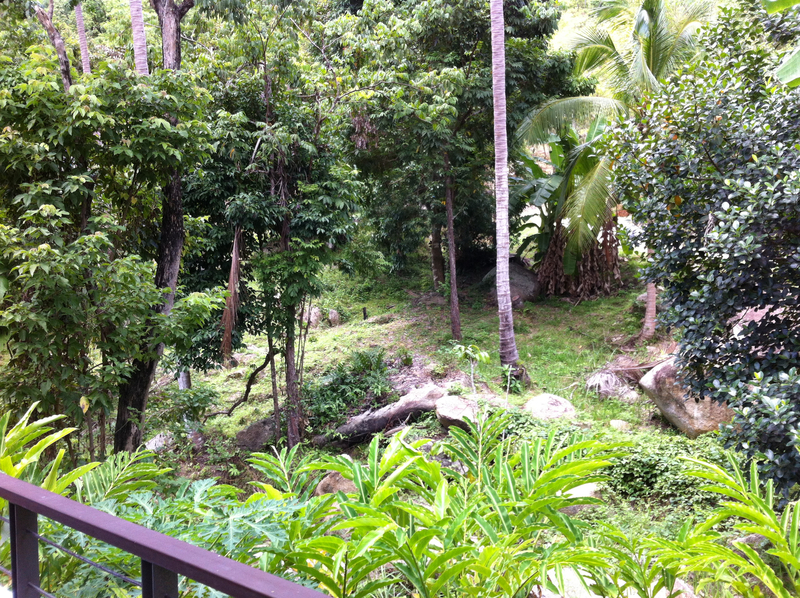 Expats, naturally, bring development to any Paradise, and on Samui, construction is everywhere. Crews are brought in from cities around Thailand and other countries to work on the sites; they are bused from their communal housing to the workplace in the morning and bused back in the evening, and the signs of their work can be seen in the most unexpected of places. Unfortunately, where a sense of conservation and preservation is thematic on the island, its rank oposite is equally so. 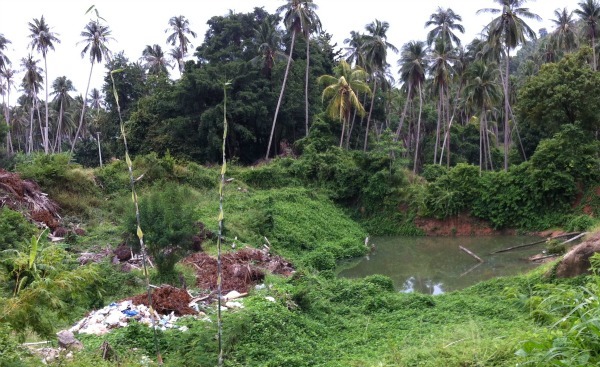 Impromptu garbage dumps abound in the jungle, along the beaches. In any case, as I said before, I was lucky. I saw no garbage in the water. But I was told that there are times when the beaches are piled high with discarded nets and food containers, thrown off the fishing boats; algae find their way to some of the coves, and jelly fish, wrenched from elsewhere by storms, will taint the joy of swimming. But I was never subjected to any of that. All I saw were lovely white beaches and clear, inviting water. Because you’re on the Gulf of Thailand, you don’t even have the interference of waves. I told you, just enough gentle undulation and the weight of salt to remind you you’re in an ocean. Paradise. Massage enthusiasts must love these beaches. Everywhere you go, there are impromptu massage tables set up to enable a client to can lie down, listen to the sound of the gentle surf, bask in the sun, and indulge him/herself in relaxation. 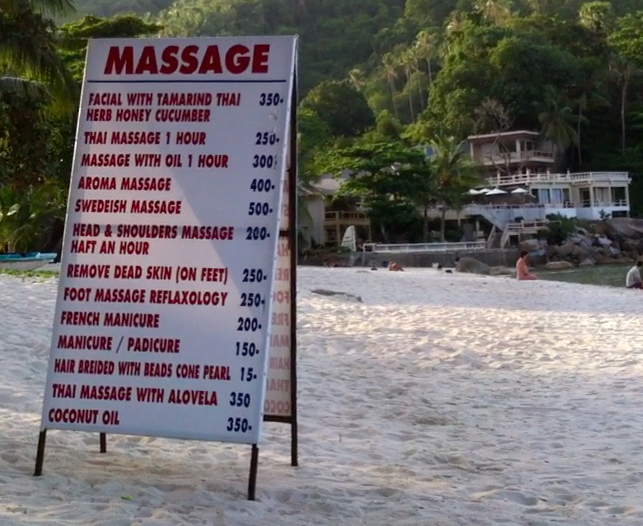 And on top of that, it’s Thai Massage — very hot these days! All along the shorelines, food mongers gather, offering every kind of seafood and fresh fruit and vegetable one’s imagination can conjure. Like coconut water? You needn’t walk fifty steps between sellers offering to open a freshly fallen coconut and make available to you its succulent and refreshing juice. 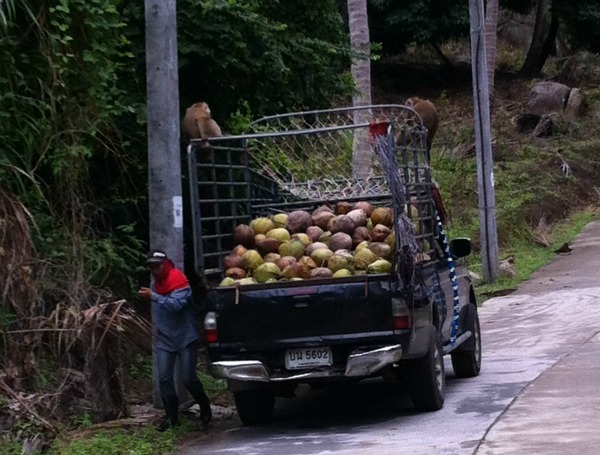 There are lots of coconuts on the island, and the natives are very good at gathering them. They’ve got cheap help too — local monkeys are trained to climb the trees, twist the giant nuts from their limbs and throw them to the ground for harvest. Of course, this can create something of a hazard to beware of — a coconut thrown from a height of 60 feet (frankly, even a coconut pulled by its own gravity from a height of 60 feet) can do real damage to your head and other bodily parts. Even Paradise has its dangers. More exist than meet the eye, actually. Like serpents and such also live here. As I was about to go for a walk down the jungle path that led from my home base to the beach, I was warned, “Just in case. . . if you see a snake, let it pass. People get hurt because they don’t see the snakes and step on them or something try to catch them. Just let them pass.” What kind of snakes, I wonder aloud. “Cobras — especially King Cobras — and vipers mostly. At the CDC office where I got my travel shots, I was warned to avoid bats and mosquitoes. “Sleep in clothing,” the doctor told me. “Bats will bite you while you sleep, and you won’t even know it. And wear Deet so the mosquitoes leave you alone.” I saw a couple bats flying by in the evening when were were out, but I remained unmolested. 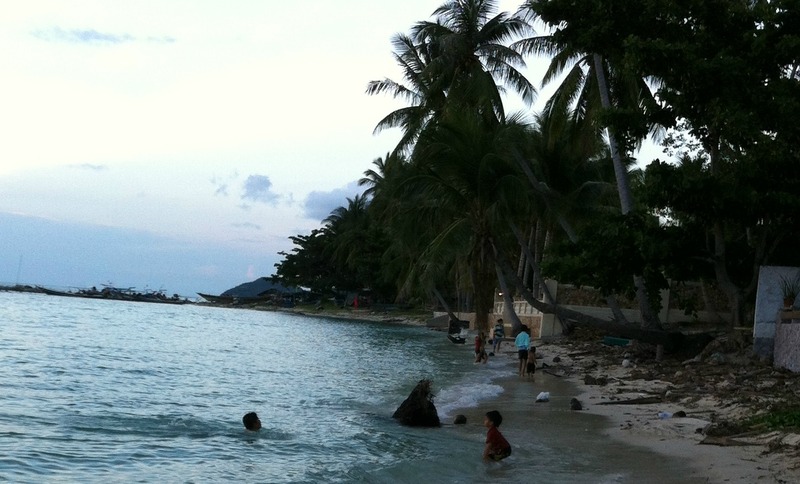 Though there are mosquitos on Samui, malaria is rare, but dengue fever, another mosquito-bourne disease, is less rare. Still, it’s not considered threatening enough to cause alarm, and few among those living here would even consider using Deet. We did carry a naturopathic bug spray around with us, and that seemed to suffice; one night, when we went for dinner at a beautiful beachfront restaurant, the waiter brought us bug spray with our menues; we did apply the substance, and we were left alone. Didn’t I tell you this is paradise? 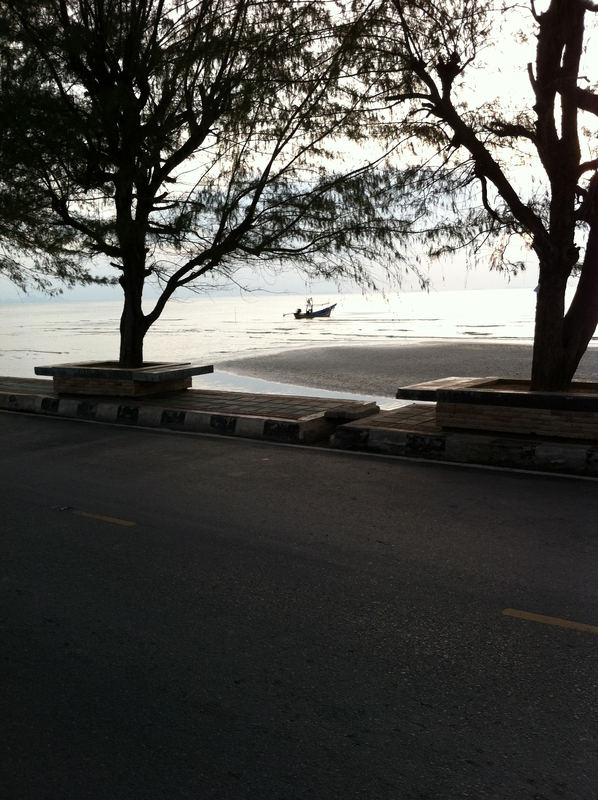 Some beautiful places are plagued by rats, but I saw none on Samui. What Samui does have is a large population of feral dogs. They congregate like rats, menace local runners, threatening small pets; they also lounge around in the middle of the road, creating a serious hazard for drivers, especially for those on the ubiquitous motor bikes. And, speaking of perils, the motorbike riders are their own kind of menace. There are so many of them that they have developed a kind of entitlement, a stance, at least, that suggests that they believe they own the road. Driving a car or walking can be risky because there is little awareness on the part of the swarming bikes’ drivers that there is anyone else on the road, and a little scooter can do great damage to a small car or little person attempting to navigate around it. But these are minor impediments to an environment that is otherwise without flaw. Always fun to read “the reality” of visiting places on earth, stripped of the travel broshure’s perfect paradise descriptions. Glad you had a good time Carla. Thailand is on our list of places to go. Hope you are getting along OK in the wake of Sandy.